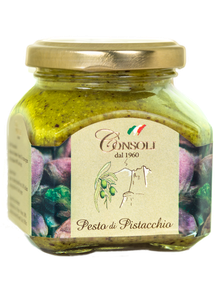 The pistachio pesto is produced by means of traditional and natural methods out of a selection of the best pistachios made on Sicilian territory predominantly grown on the territory of Bronte and Adrano. The pistachio pesto is not produced with processing wastes, but it is made using only carefully selected pistachio and high quality ingredients, such as 100% Italian extra virgin olive oil, to obtain a unique taste and a delicate flavour. Toasted pistachio, 100% Italian extra virgin olive oil, salt, pepper. 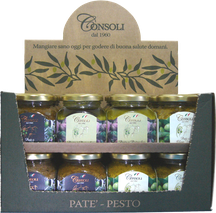 Ideal to make delicious pasta, for filled meat stuffing, to make savoury tarts and on toasted bread.